Product prices and availability are accurate as of 2019-04-20 10:43:20 EDT and are subject to change. Any price and availability information displayed on http://www.amazon.com/ at the time of purchase will apply to the purchase of this product. 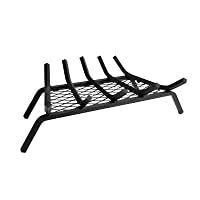 T-Grate Series Cast Iron Fireplace Grate. Saf-T Grate'sTM self-feeding design keeps the wood and hot coals together, so your fire burns neatly, safely and more efficiently. The heavy-duty cast iron deep-bed construction keeps the logs where they belong and allows air to reach the logs from all angles. Assembly Required. Dimensions: 18"x12" Grate - 18" L x 12" W x 4.5" H; 21 lbs. 30"x16" Grate - 30" L x 16" W x 4.5" H; 39 lbs.